Calxa Express is suited to small businesses who want a quick and easy budget and cashflow forecast. 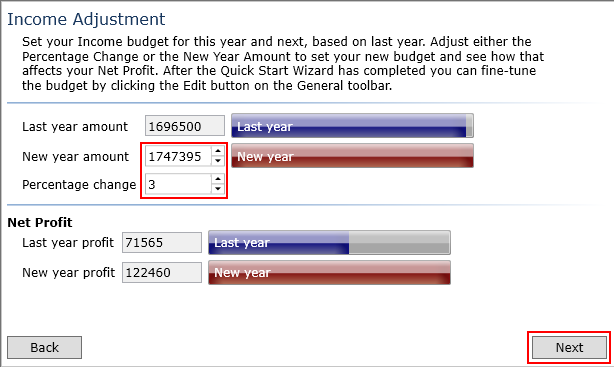 The Quick Start Wizard will help you create your first budget and set the basic settings required for a cashflow forecast. 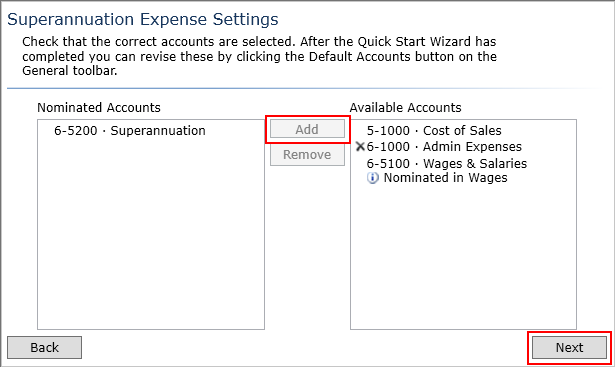 If you create an organisation while running Calxa Express the Quick Start Wizard will launch automatically however you can also access the Quick Start Wizard from the Organisation Management screen at any time. 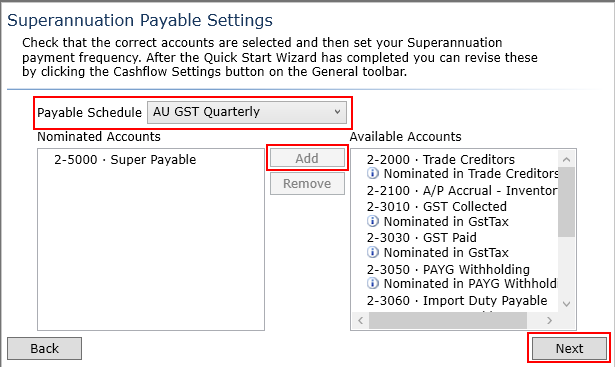 You should be aware that the Quick Start Wizard will overwrite any existing budgets including those imported during the Create Organisation step. If you do not want to overwrite your existing budgets you should not run this Wizard. Note: You will notice that the net profit at the bottom changes relative to your income adjustments. 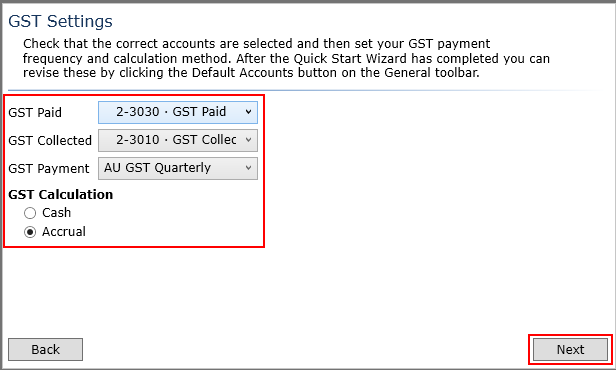 Select your GST Paid and Collected accounts. 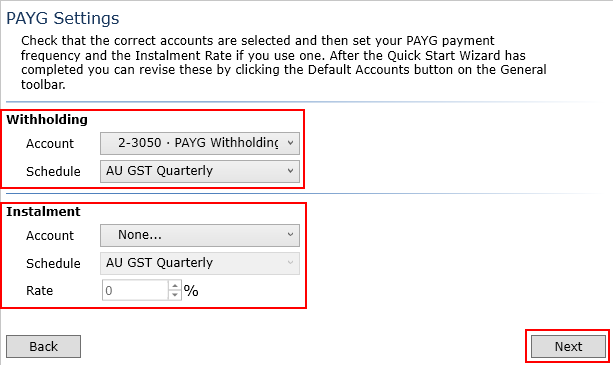 Note: They may be the same account depending on your accounting setup and is sometimes called your GST control account/s. Note: For more info on payment frequency please refer to the Cashflow Schedules section of the Preparing a Cashflow Forecast help note. Select your GST calculation method. Select your PAYG Withholding account and appropriate payment schedule. Note: This is the account that tracks your employee tax withheld. If you have a PAYG Installment select the account that it gets allocated to, select the appropriate schedule and enter the installment rate percentage. This rate is a percentage of Income. If you do not use this calculation method you should select None... and budget for this manually. Note: This is an installment account for company tax. 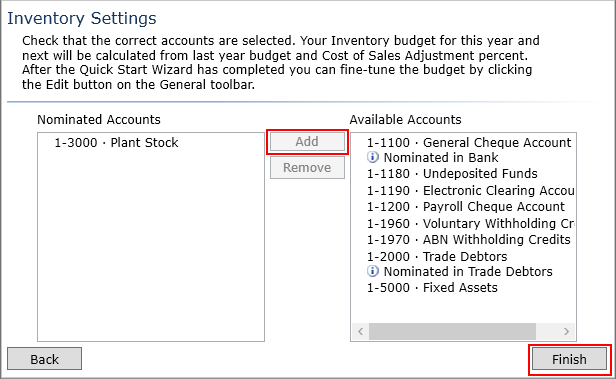 Note: You may allocate accounts by selecting on the Available Accounts column and clicking Add or by dragging and dropping from Available Accounts to Nominated Accounts. Nominate all superannuation expense accounts . Note: The sum of the budgets you have on these expense accounts will be used to calculate your superannuation payable budget. Note: An inventory account will be treated as a purchase account with creditor days payment terms. You can display a Cashflow Forecast chart by clicking Show Cashflow forecast chart. This chart is also available under the reports menu. The Cashflow Forecast chart shows what the bank balance is predicted to be month-by-month over the next twelve months. While you have provided enough information with the wizard to create a rough budget and cashflow forecast it is important to review your budget. An accurate budget is required to calculate an accurate cashflow forecast. The wizard gives you a good starting point however it cannot include all possible variations of your business in coming months and years. Calxa provides a starting checklist to help you review and fine tune your budget. Click on View Quick Start Check List to view or print this checklist. To review and fine tune your budget please refer to the following help note – Editing Budgets.